Over the past few decades, the collecting of fishing tackle has grown in popularity. Years ago, I could obtain a tackle box full of lures and bobbers at an auction with a bid of $20.00 to $30.00. A similar box today will sometimes cost me considerably more, especially if there is a certain bait sitting in one of the trays and definitely more if there are a couple of other collectors in the room. Back in the early 80s I would look at the people I was bidding against and we would have a lot in common: we would be about the same age and have similar interests such as cottages, boating, and fishing. This is not always true today as we have lots of young people collecting tackle; it is not just a hobby for the 50 and over club. With most collectors our interest in tackle started when we were children. We spent lazy summer days fishing from a boat and poking around in a grandfather's or uncle's tackle box. The various metal and wooden baits would pique our curiosity causing us to wonder at the mystery and use for each one. If we were lucky, we triumphantly put to memory what bait was used to catch what species of fish. As adults we got hooked again by these same baits; but, now we see them from a different perspective. We see the craftsmanship of the lure, the paint patterns with their several coats of lacquer that have kept it pristine. We notice the placement of the hook hardware and eyes. We see the beauty of an object well made. So what exactly are we collectors collecting? The field is wide and varied, going well beyond lures. One area of collection is rods of all different materials and types -- steel, cane, and fiberglass in their various styles such as fly, bait and boating rods. We also collect the reels made for all of the above-type rods, landing nets, metal baits, wooden baits, glass minnow traps, minnow pails, sinker tins, hook tins, bobbers and wooden line spools. Then there are flies, fly wallets, fly boxes and creels. And we are always on the look out for lure boxes, as most collectors have lures just waiting to be matched up with its box. Another fascinating aspect are the historical documents: advertising pieces, fishing regulations, fishing licences, game warden badges and fishing club jacket patches. People are different and so are their interests. Some collect only a certain coloured bait such as strawberry or spotted; while others collect a certain shaped plug such as frog baits. Nonetheless, the main item of obsession and desire is the wooden plug. There are many books available that allow the collector to identify a plug right down to its manufacturer’s series number, its length, colour code and the years made. These books also inform the collector of changes to such things as eye type and hardware type. Most collectors start out as gatherers, keeping and sorting everything they obtain. Inevitably, after several years of accumulating, we come to realize what we really like and start trading with others. This is ultimately the way to go for two reasons. One, most of us can’t keep spending forever! And two, it is nice to add a piece to your collection while helping a fellow collector with his. Once in a while some baits come along that we know nothing about. This always turns into a fun puzzle. After researching in all the reference books we then take these baits to shows or post them on websites and hope someone somewhere has the answer to their origin. Amongst collectors, the most sought after baits are still the ones made by the well- known companies in the United States such as Heddon, Creek Chubb, South Bend and Shakespeare. However, I have been pleasantly surprised in the growing interest and respect our Canadian tackle companies are finally receiving. Some sought after Canadian baits were made by such companies as Allcock, Laight and Westwood of Toronto (A L&W), Hex Baits from Brockville, Lucky Strike Bait Works of Peterborough and Northern Tackle Co. of Sudbury. For years we didn’t have many people interested in our own baits and they didn’t have much value in a trade or sale. The one down side to this reversing trend is watching our neighbours to the south out bid us and seeing “our” baits head south. I guess turn around is fair play as we have collected their baits for years. An important part of collecting for me has always been the history of tackle companies and, after I retired a few years ago, I found the time to spend on research. My inquiry into the Horrocks-Ibbotson Tackle Company of Grimsby (H-I) led to a newspaper article which got the word out and brought forth contacts by former employees now in their nineties and relatives of employees who were good enough to share their memories and to answer questions. I have learned that in 1933 H-I of Utica N.Y. bought a building at the south-west corner of John and Robinson Streets in Grimsby and made just about everything related to fishing until 1941 when it burned down. The plant had been started so H-I could jump Canada’s new tariff act. My interview with a former employee revealed a first-hand experience of watching the plant, and her job, going up in smoke. She gave me some charred silk spools that she picked up after the fire. She had been a winder in the cane rod department and that was all that was left of her work station. I have a 1935 magazine article that has then manager, Harry Banks, describing the factory as “…a well-ventilated, daylight plant running full time and situated in the heart of one of Canada’s prettiest districts, one hundred percent Canadian labour and the happiest crowd you ever saw.” The old girls I spoke to don’t remember it being that good! One thing leads to another and it appears that after the fire Harry stayed in the tackle business, on a smaller scale, opening his own shop in neighbouring Beamsville. Upon his death the business was sold to the Savage Brothers, Andrew and Fred, who carried on in the sinker business from 1959 to 1968. I have sat and talked to Fred and his wife Donna. When I told Fred I have found their little plastic boxes of assorted sinkers in a lot of auctioned tackle boxes he said they were sold all over the world. They all came from a small building behind a house on Albert Street in Beamsville. It is hard to imagine twelve employees and the two families working in this small building making 250 kinds and sizes of sinkers. Being a cottager in the Campbellford area has led to an interview with a very spry 97 year old fellow named Harry Cubitt who worked at the Frederick’s Fishing Tackle Works when he was young. They were in business in Campbellford from 1933 to roughly 1938 turning out what have come to be known as the Campbellford Baits. My new friend Harry relayed some very interesting information on the making and the distribution of the baits. 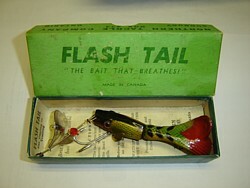 The baits were sold through Woolworth’s Stores right across the country and the lures were never boxed but sold on cards. I could write an article on Harry himself. What an interesting fellow. The Allcock, Laight and Westwood Fishing Tackle Company was first located at 78 Bay St. in Toronto. This firm made wooden plugs for the CCBC of Garrett Indiana and also made baits of their own design. AL&W was in business from 1854 until 1977 when it was purchased by Bill Edgar of Lucky Strike. I will finish with the gem of Canadian antique fishing tackle, Lucky Strike Bait Works of Peterborough. This company was born out of a love for fishing and the lack of money to spend on lures. In 1929 a pattern maker named Frank “Rusty” Edgar, started Lucky Strike in the depression with a lathe he made out of an iron bed frame. Rusty turned out some broom stick baits that caught fish. He landed a contract in 1931 with Direct Factory Sales (DFS) and, with the help of his wife Elsie, he never looked back. Rusty’s baits are driving this great surge in Canadian antique tackle interest. Collectors hunt for the full range of plug designs and colours and the very hard to come by bait boxes with their stunning graphics that Rusty also designed. Rusty’s son Bill came into the business (even thought he was always around it) after finishing his apprenticeship as a tool and die maker. When Rusty died in 1979, Bill and his wife Cora ran the bait works until they retired and their daughter Mary and her husband Kim Rhodes took over. This is Canada’s largest tackle maker and is still a family-owned and Canadian-owned business. Bill and Cora are members of the Canadian Antique Fishing Tackle Association (CAFTA) and are two of its greatest supporters.